Introducing Doggie Dupes! Our monthly K9 comparison. We found these treats to not be very similar, BUT we preferred the Kirkland Signature because they are gluten free and have a few more vitamins and minerals for our sweet pups! We think the bumps on Kirkland Signature's chew worked better! Brandefy compares off brands (e.g., Kirkland Signature) to name brands (e.g., Greenies) to show you when the generic is as good as the name brand, and to warn you when it is not. Our purpose is to help you save time and money, and to have a good time while doing it. It's no secret that Brandefy LOVES dogs! We have some sweet pups at HQ, and we want to treat them the best we can. We picked up Costco's version of the Greenies Original Dental Treats to see which did a better job at cleaning doggie teeth. While we found that our dogs were eager to try both (our tester pups will eat anything, haha), and they both cleaned well enough, there were several differences here. First, notice the texture of each stick. We think the bumps on the Kirkland Signature were more effective. They both smelled the same, but the color is quite different. The ingredient comparison was where we found the most discrepancy. They both listed the vitamins and minerals, but Kirkland Signature had slightly more of the good stuff. The number one ingredient in Greenies is wheat gluten, while it is sweet potato in Kirkland Signature. One lovable Brandefy Golden Retriever is allergic to gluten. While we think this is a preference thing, we certainly preferred the more wholesome ingredients in the Kirkland Signature chews. 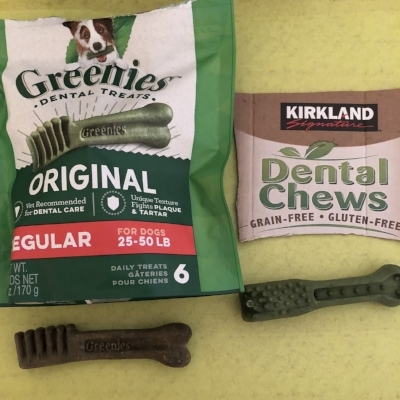 These chews are not very similar, but we will be treating our pups to the Kirkland Signature dental sticks in the future and saving some money!